People on Twitter are asking if Fille Cainglet will play on Sunday against the NU Lady Bulldogs after a long lay off due to her right ankle sprain injury that she suffered late in the first round against the DLSU Lady Archers. They can now breathe a sigh of relief because the Ateneo Women's Volleyball Team has already given a clue via the FILLETHEPAIN hashtag that I saw in the status below. It's as if saying, feel the wrath of our Ace Player Fille Cainglet! 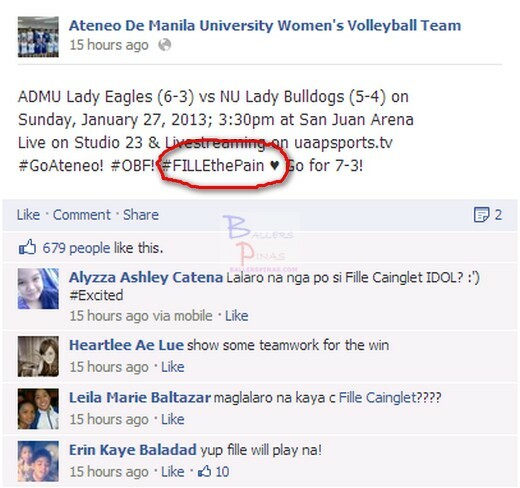 "#FILLETHEPAIN" might be a clue that Fille might already play on Sunday against NU Lady Bulldogs.